Michael Young will be looking out from a new dugout in 2013. 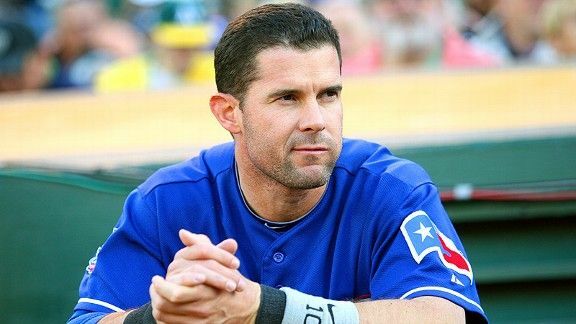 Once one of the game’s top hitters, Michael Young will be looking for a bounceback season with his new team, the Philadelphia Phillies, in 2013. The Phillies thought enough of Young to trade a pair of young pitchers for him. What is his outlook for 2013? Let’s take a closer look at the numbers. Statistically speaking, Young’s 2012 was the roughest season of his career. Young’s overall value was 2.4 Wins Below Replacement, the second-worst among position players for that stat in the majors, ahead of only Kansas City Royals rightfielder Jeff Francoeur and was the third-worst by a Rangers position player in team history. Young’s .277 batting average and .312 on-base percentage were his worsts in those categories since 2002. His .682 OPS was a career-worst, as was his rate of 76.4 at-bats per home run. Young finished 2012 with eight home runs. His homer total has declined in each of the last three seasons. He went 88 games without a home run from May 8 to August 18, by far the longest streak of his career. That said, Young is not far removed from the 2011 season, when he set a career-high with a .338 batting average. His .380 on-base percentage that season was the second-best of his career. Young departs Texas as the Rangers all-time leader in hits (2,230), runs scored (1,085) and games played (1,823). He also ranked third all-time in batting average (.301) and RBI (984), and was a seven-time All-Star team selection. Young got his first career hit in 2001. Since that season, Young rates fourth among all players in hits, trailing only Ichiro Suzuki, Derek Jeter, and Albert Pujols. What’s a stat to watch for to see if Young is going to bounce back? Young’s numbers took a big hit last season when it came to hitting fastballs. From 2009 to 2011, Young hit .354 in at-bats ending with fastballs, cutters, sinkers and splitters, which ranked second-best in the majors, trailing only Joe Mauer. In 2012, Young’s batting average against those pitches dropped to .284, taking him from a hitter who excelled against those pitches, to one who was only slightly above major-league average. The Phillies plan to play Young at third base, replacing Placido Polanco. Over the last four seasons, Young has -35 Defensive Runs Saved (a stat that measures the effectiveness of turning batted balls into outs, defending bunts, and converting double plays) at third base. That is the third-worst among the 52 third baseman with at least 1,000 innings played in that span. Polanco ranked fifth with 18 Defensive Runs Saved over that same span. Young will be trying to bounce back, but the numbers indicate that will be an uphill battle. Of the four other age 35-or-older players to post a WAR as bad as Young’s -2.4 in a season since 1994, two never played another major league game after that season. The other two- Dante Bichette and Tony Womack- played two and one more seasons respectively. The next Phillies priority could be for a power bat. Their two notable offseason position-player acquisitions- Ben Revere and Young- ranked worst and seventh-worst in extra-bases per at-bat (a stat also known as “Isolated Power”) last season.